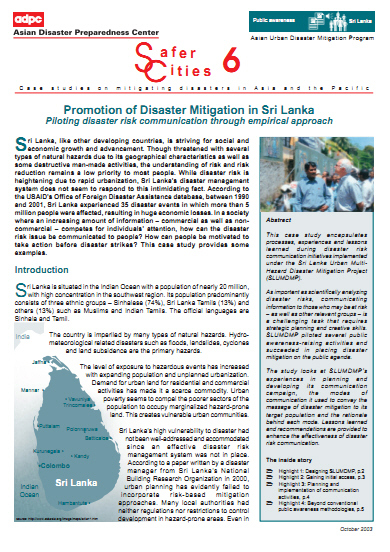 This case study encapsulates processes, experiences and lessons learned during disaster risk communication initiatives implemented under the Sri Lanka Urban Multi-Hazard Disaster Mitigation Project (SLUMDMP). As important as scientifically analyzing disaster risks, communicating information to those who may be at risk – as well as other relevant groups – is a challenging task that requires strategic planning and creative skills. SLUMDMP piloted several public awareness-raising activities and succeeded in placing disaster mitigation on the public agenda. The study looks at SLUMDMP’s experiences in planning and developing its communication campaign, the modes of communication it used to convey the message of disaster mitigation to its target population and the rationale behind each mode. Lessons learned and recommendations are provided to enhance the effectiveness of disaster risk communication.